Welcome to my blog about all things yummy. This week's I Heart Cooking Clubs is called Mad About Herbs. I chose Jamie Oliver's Southern Sausage Stew. If you like bell peppers, you'll love this dish. There's a ton in the recipe. I didn't love it but I didn't hate it. Make sure you season it will with salt and pepper before you serve it or else it will be really bland. I also cut the amount of cayenne in half. It was still spicy but not overwhelming. Put a splash of olive oil in a large saucepan and let it get hot.Add your sausages and let them cook away so they brownnicely on all sides. Once golden and crisp, take them out ofthe pan and put them on a plate to rest. Depending on yoursausages, there may be a lot of fat left behind in the pan. Youonly want to keep about ¼ cup of it in the pan, so carefullypour any extra away. If you don’t have enough, just add asplash more olive oil.Add your onion, bell peppers, and celery to the fat and fry ona medium heat for 10 to 12 minutes, stirring occasionally, untilsoftened. Stir in your garlic, chiles, thyme, and spices and fryfor another minute or two. Stir in your fl our and vinegar, andafter a couple of minutes add your browned sausages, chickenbroth, and canned tomatoes, using a wooden spoon to breakthem up a little. Season with a nice big pinch of salt and pepper,stir, then bring to a boil and let it tick away for 15 minutes or so,until you have a thick and delicious gravy.Serve with a hearty spoonful of rice on the side and sprinkleover some sliced scallions, chopped parsley, and any reservedcelery leaves. Really tasty stuff!PS: I’ve also stirred chopped up pieces of cooked chicken,quail, and smoky bacon through this with great results! Put a splash of olive oil in a large saucepan and let it get hot. until you have a thick and delicious gravy. I like bell peppers, but not the green ones so much, so I think I'd love this one with red and yellow. It looks delicious, we like spicy! It looks like it would be delicious--sorry it wasn't a bit hit with you. I had this one marked, now I'm not sure :-) Was it the amount of peppers that was a problem? Jamie has a stew-like recipe with sausages and lentils in Jamie's Italy that I loved and I thought this one would be as good. I might make half a recipe to see. Thanks for telling us about it. Looks yummy! I am a fan of sausage and peppers. I agree, I am all for increasing the aromatics! Sorry you where dissapointed bij the outcomings of this recipe, it looks wonderful to me tough. 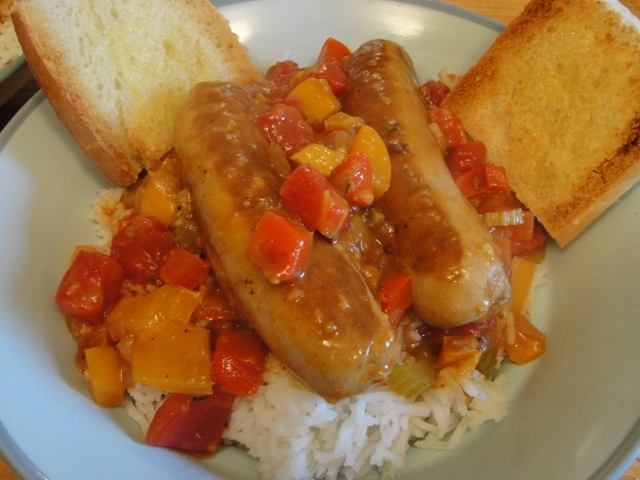 This sounds like a great dish - love the idea of all those peppers with the sausages. Sorry you were a bit disappointed in the dish - I think I'd still give it a try though. It certainly does look delicious, but I can see where 1 teaspoon of cayenne could be too much. Love how it's served over rice with bread on the side (I'm a total carb queen)! Finding my way as a new mom and hopefully fitting in some kitchen time. Magnum Ice Cream Bar = YUM!